NEW YORK TIMES BESTSELLER • An award-winning guide to the sometimes erratic and confusing behavior of teenage girls that explains what’s going on, prepares parents for what’s to come, and lets them know when it’s time to worry. Look for Under Pressure, the companion guide to coping with stress and anxiety among girls, available now. • My thirteen-year-old rolls her eyes when I try to talk to her, and only does it more when I get angry with her about it. How should I respond? • Do I tell my teen daughter that I’m checking her phone? • My daughter suffers from test anxiety. What can I do to help her? • Where’s the line between healthy eating and having an eating disorder? • My teenage daughter wants to know why I’m against pot when it’s legal in some states. What should I say? • My daughter’s friend is cutting herself. Do I call the girl’s mother to let her know? 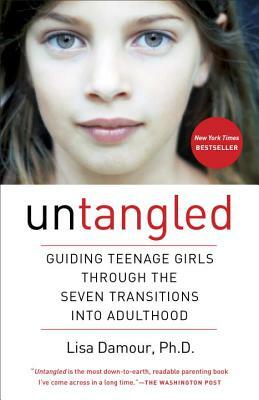 Perhaps most important, Untangled helps mothers and fathers understand, connect, and grow with their daughters. When parents know what makes their daughter tick, they can embrace and enjoy the challenge of raising a healthy, happy young woman. Lisa Damour, Ph.D., graduated with honors from Yale University, worked for the Yale Child Study Center, then received her doctorate in clinical psychology at the University of Michigan. She is the author of numerous academic papers and chapters related to education and child development. Dr. Damour directs Laurel School’s Center for Research on Girls, maintains a private psychotherapy practice, consults and speaks internationally, and is a faculty associate of the Schubert Center for Child Studies and a clinical instructor at Case Western Reserve University. She and her husband have two daughters and live in Shaker Heights, Ohio.